Best time is on the weekends; during the week away from studio a lot. Weddings in the Omaha Lincoln & Council Bluffs area are always a lot of fun. The spirit and festive celebrations are unique to each couple. As much as wedding can be similar, they always surprise you of how each is so different. It is with honor that I can be a part of this unique time in their lives and photograph the event that binds families together. To each and every bridal couple, "I thank-you" for allowing me to participate in your wedding. The "Stepping into the Dress" sequence. The stepping into the dress is coverage of the bridesmaids helping the bride get into her dress. When this service is requested, I hire a female assistant or in most cases, I just provide a preset camera to one of the bridesmaids. This sequence of the wedding story has been very popular and 75% of brides do want it. To see samples of the "Stepping into the Dress" click of the picture set to the left. 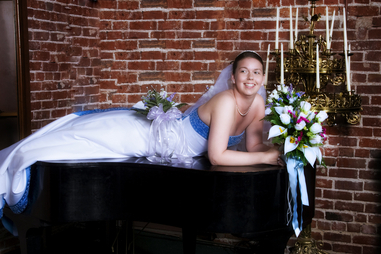 Wedding photography in Omaha, Lincoln & Council Bluffs is very competitive. It seems anyone with a digital camera wants to be a wedding photographer. All the new amateurs starting throw out these really cheap packages because they do not provide the superior quality and experience in photographing weddings. They do not believe in themselves or their skills so you get really cheap prices. 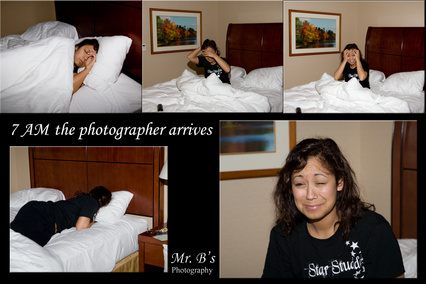 Based on the national average in 2010 earning less than $50,000 a year, the cost for a wedding photographer was $2,700. A store front studio on average has to charge $500 to $600 more than a home based studio because of overhead expense. Here in Nebraska & Iowa, wedding photographers working out of their homes is approximately 95%. As a photographer of Omaha & Bellevue NE, wedding photographer, I have always worked out of my home. It helps keep my prices competitive while maintaining a high quality. How does photographer establish a price for a wedding package? Let us take a look at that question here. Supply and Demand is the number of competitive prospects for the number of events to take place. Number of wedding photographers to number of weddings gives you supply and demand. The figures are pretty close to the number of wedding photographers available for every wedding is around 100. Experience provides for quality. The more a person does one thing the better and more proficient they become a doing it. Thus the experienced photographer will tend to give you a much greater quality product. The better the quality, the higher the price will be. Equipment to do the job is a major factor. The better the equipment the higher the photographers expense. Multiple or backup equipment continues to add to the expense. A fireman does not go to fight a fire with only one water hose; neither does a professional photographer go with one camera. A professional wedding photographer has backup cameras, backup flash units, batteries, lights, lenses and more. It is not uncommon for a wedding photographer to have as much as $20,000 to $30,000 in equipment to cover your wedding properly. Cost of the products they provide you in your wedding packages. Albums, frames, folders & packaging, the advertisements, websites, services and cost of prints, utilities and more are expenses. A can of soda cost only penny’s to produce, add the cost of labor, packaging, shipping, advertising and you end up paying $1.50 for a soda. Time of work involved in a wedding may surprise you. Take the engagement session; as much as 1 to 2 hours shooting the engagement photos. The Wedding & reception coverage can be 8 to 12 hours of work for the wedding photographer. Digital requires the transferring of files from one media to another and a processing of images. Wedding photographer spend many hours of editing and processing the photos prior to the bridal couple seeing the proofs. Selecting photos and editing and touching up the photos for an album can take 10 to 20 hours of work along with designing the wedding pages for the albums. The delivery of the final products also takes time and involvement. The average wedding package involves 40 to 50 hours of work on just one wedding. Now would you work a full week and only get paid for one day? No! Neither do professional wedding photographers. As a wedding photographer in Bellevue, NE for the last 20 years, I have always enjoyed shooting weddings. The changes in the wedding photography has made for a lot of competition, but I am still here doing what I love to do; shooting weddings.